Be Sweet founder, Nadine Curtis, is one of my heroes. 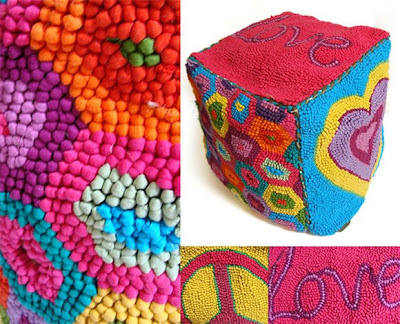 I’ve blogged about her company before, but had to post again since she is now selling these amazing hooked cotton poufs made from recycled t-shirt fabric in Africa. Called the Mielie Cube, it’s customizable and sold as an empty cube that you can fill with cotton, fiber fill or even packaging peanuts to become the ever-versatile ottoman. And if that’s not your style, use it as storage for stuffed animals or clothing. Would look gorgeous in a white on white, eclectic California-chic living room! Be Sweet’s mission is to bring socially and environmentally friendly products to fashionable consumers. Nadine’s products evoke an individual style and help support community development around the world including several job creation programs in South Africa. Says Nadine Curtis; "I started Be Sweet to support artisans by bringing their products to a wider market of conscience consumers interested in beautiful things that fund community development. Our products embody the ideals of beauty, creativity and resourcefulness." Lovely colors, liked your earlier post about the poufs too.